Frontiers of the Compact Modeling for Advanced Analog/RF Applications : This workshop goal will be to classify the most important directions for the future development of the electron device models, not limiting the discussion to compact models, but including physical, analytical and numerical models, to clearly identify areas that need further research and possible contact points between the different modeling domains. 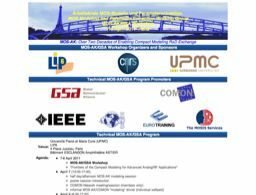 This workshop is designed for device process engineers (CMOS, SOI, BiCMOS, SiGe) who are interested in device modeling; ICs designers (RF/Analog/Mixed-Signal/SoC) and those starting in that area as well as device characterization, modeling and parameter extraction engineers. The content will be beneficial for anyone who needs to learn what is really behind the IC simulation in modern device models.